On Sunday 26th February 2006 the existing beacon hardware was replaced with new state-of-the-art beacon hardware boasting several new RF and digital features. The new beacon was the culmination of a year of design and construction work by a team of four radio amateurs and included technology that had never before been used in an amateur radio beacon. At the heart of the beacon is a direct digital synthesiser designed, constructed and programmed by Andy Talbot, G4JNT. The direct digital synthesiser allows the beacon to be programmed to transmit new modes. 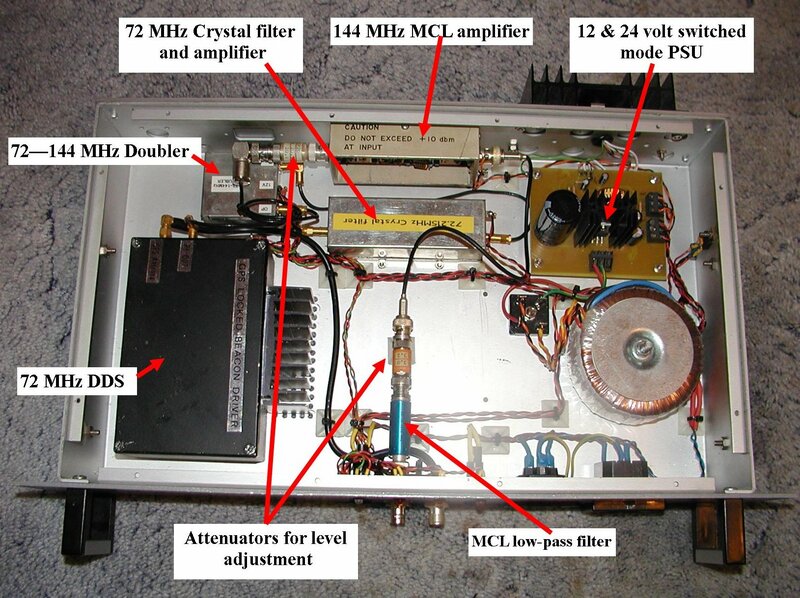 The DDS generates a signal directly at 72MHz and is L/C and crystal filtered and doubled to 144MHz. before passing to the PA. The DDS clock source will be locked to GPS with a short time-constant phase-locked loop, and will normally maintain accuracy to within a few parts in 10-9 over a period of a few tens of seconds, and better than 10-12 long term. The frequency of the CW carrier (mark) being exactly on 144.430000MHz. The beacon sends its callsign and locator in Morse, but uses A1A (on /off) keying rather than FSK. To enable the beacon to be monitored at extreme ranges, the beacon also transmits its callsign and locator using WSJT JT65B mode. The GPS also provides for the precise timing of the keying sequence, such that the JT65B sequence will start at every even minute past the hour for 48 seconds duration. At the start of each odd minute 30 seconds past the hour, at a precisely timed point, 140 microseconds after the UTC one-second reference as signalled by the GPS receiver, the phase of the carrier is reversed, 28 times in total to fill up the 30 second time slot. The result is a 1 bit/second pattern of 101010….. 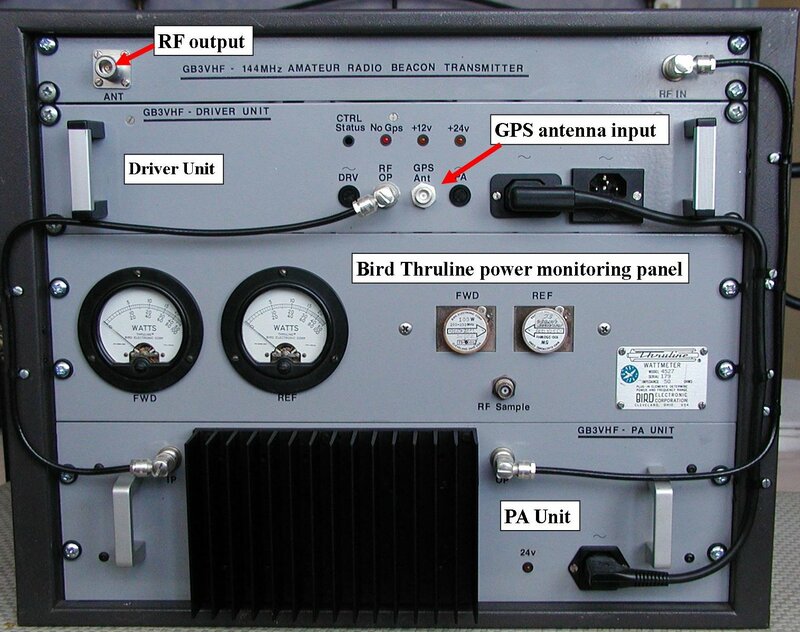 The BPSK mode has been incorporated to allow users to become familiar with using precise timing methods to assist in experimentation with coherent signal recovery, to measure time of flight information and propagation testing. 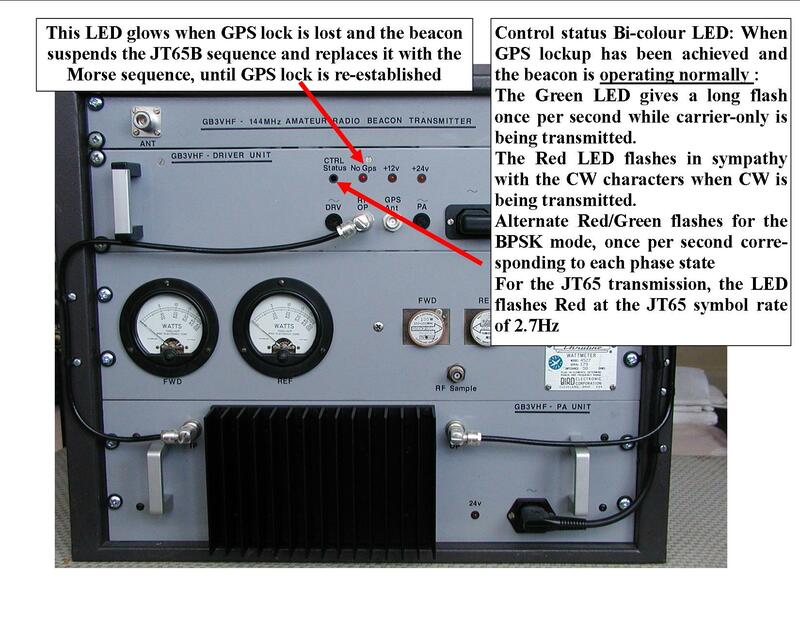 In the event of GPS lock being lost, the beacon will suspend the JT65B sequence and replace it with the Morse sequence, until such time as GPS lock is re-established. Full details of this unit can be found on Andy’s website www.g4jnt.com. 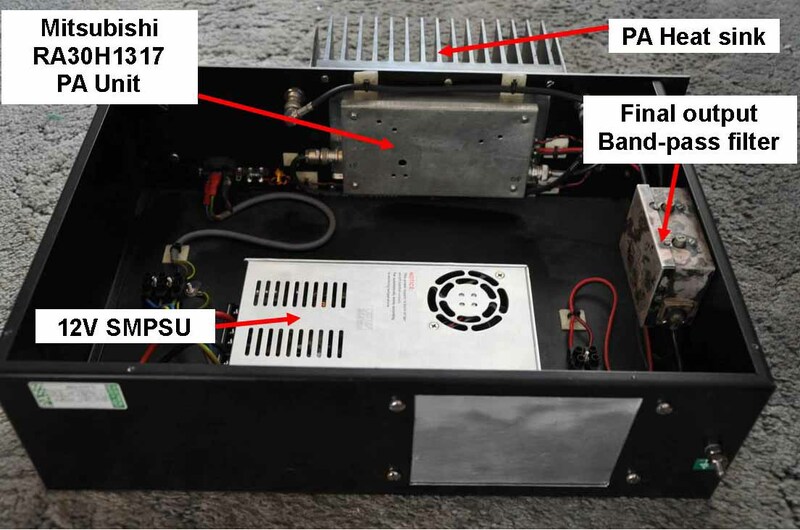 The beacon’s RF section was designed by Sam Jewell, G4DDK and relies on a Mitsubishi RA30H1317 power amplifier module for the PA. The use of extensive RF L/C filtering throughout and a special crystal filter at 72MHz ensures that the beacon complies with the most stringent CEPT regulations for transmitters operating in the VHF frequency range. Both in-band and out-band spurious signals are suppressed to better than -70dBc. The crystal filter ensures also that close-in noise sidebands are adequately suppressed to ensure no interference to users listening close to the beacon's frequency, for other beacons. The PA uses only heat sink convection cooling and no extra fan cooling is provided or needed under any environmental conditions. The RF output from the driver unit is 13dBm. This drives the PA unit to produce a beacon final power output of 15dBW (30Watts). This is monitored with a Bird Thruline power monitoring panel that shows both forward and reflected power simultaneously. Chris Whitmarsh, G0FDZ, the beacon keeper, integrated the various modules and units, and produced the metalwork and housing facilities for the beacon. The beacon was designed so that the driver and PA were built as separate units to ease access and maintenance. All connections are brought to the front on the units for the same reason. 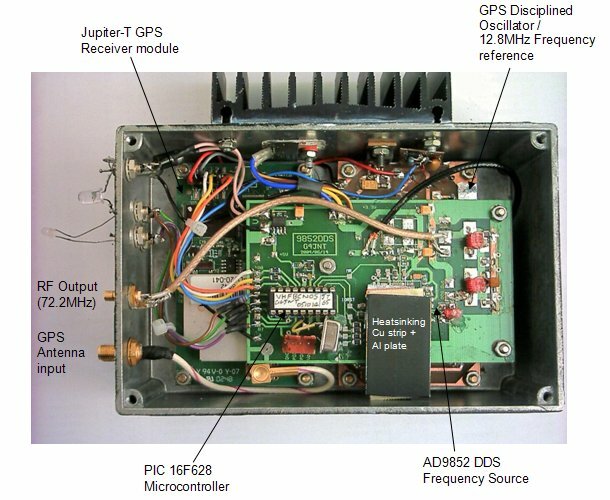 External connections to the beacon are simply mains power, GPS antenna and the main antenna system. Like most commercial systems, all the beacon units are built as 19 inch rack mount style, and the whole beacon occupies a rack space of 9U.